To this day Ceremonies play a very important part in Australian Aboriginal peoples’ culture. 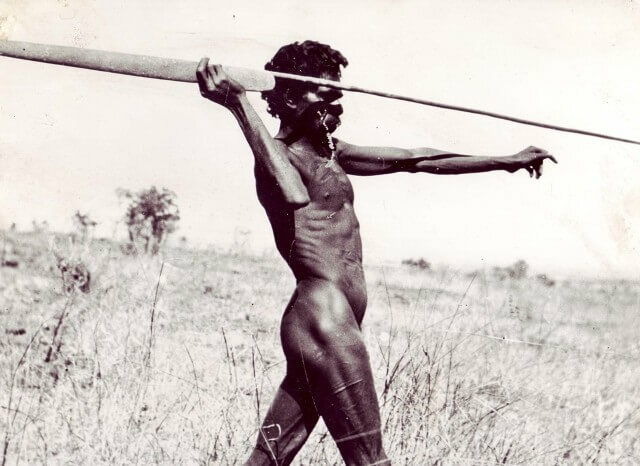 Ceremonies, or rituals, are still performed in parts of Australia, such as in Arnhem Land and Central Australia, in order to ensure a plentiful supply of plant and animal foods. They contrast in different territories and regions and are an important part of the education of the young. Some ceremonies were a rite of passage for young people between 10 and 16 years, representing a point of transition from childhood to adulthood. Most ceremonies combined dance, song, rituals and often elaborate body decoration and costume. The Elders organized and ran ceremonies that were designed to teach particular aspects of the lore of their people, spiritual beliefs and survival skills. 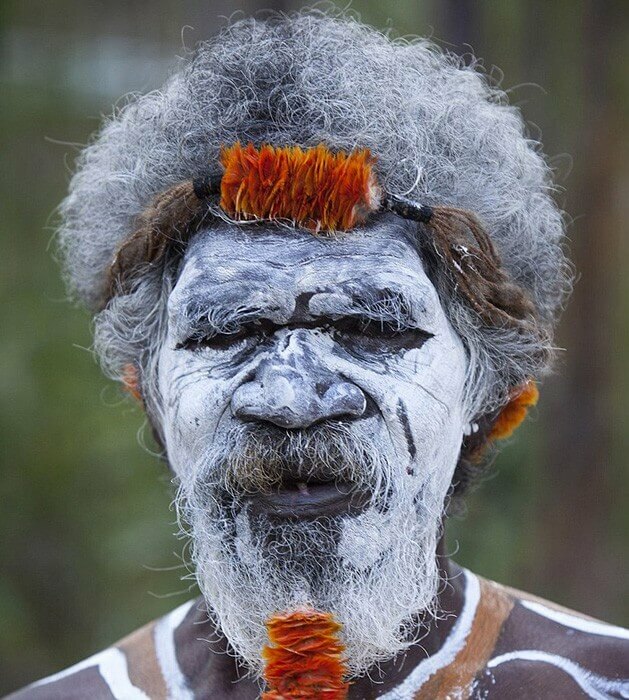 In marriage ceremonies the Aboriginal people are adorned with body paint and wear traditional headdress. Moiety is a form of social organisation in which most people and, indeed, most natural phenomena are divided into two classes or categories for intermarrying so as to ensure that a person does not marry within his/her own family. Distinguishing decorative body painting indicates the type of ceremony being performed. Ceremonial dress varies from region to region and includes body paint, brightly coloured feathers from birds and ornamental coverings. There are about 29 clan groups of the Sydney metropolitan area, referred to collectively as the Eora Nation. It is generally acknowledged that the Eora are the coastal people of the Sydney area. The Eora nation boys participated in a tooth ceremony where their front tooth was knocked out. The missing tooth was a sign to others that the person had been initiated. Invariably initiates might have their ears or nose pierced. During the Initiation process a boy was trained in the skills, beliefs and knowledge he needed for his role as an adult in Aboriginal society. Many initiation ceremonies were secret and only attended by men. Women were forbidden to be present. Equally women’s ceremonies took place for women only. Bora, also called “Burbung , is the initiation ceremony for young boys being welcomed to adulthood. This may last some weeks and involves learning sacred songs, dances, stories, and traditional lore. Circumcision, scarification, and removal of a tooth as mentioned earlier, or a part of a finger are often involved. Female Elders also prepared girls for adulthood. They taught the young females culinary and medicinal knowledge of plants and roots, and how to track small animals and find bush tucker. Some female ceremonies included knowledge of ceremonial bathing, being parted from their people for long periods, and learning which foods were forbidden. Many ceremonies took place in stages, which could be part of a longer process lasting over several years. For example, ceremonies around death would vary depending on the person and the group and could go for many months or even over years. Decorative body painting indicated the type of ceremony performed. Ceremonial dress varied from region to region and included body paint, brightly coloured feathers from birds and ornamental coverings. Aboriginal people perform Funeral ceremonies as understandably the death of a person is a very important event. The people often paint themselves white, wound or cut their own bodies to show their sorrow for the loss of their loved one. They conduct a series of rituals, dances and songs to safeguard the person’s spirit leaves the area and returns to its birth place where it can later be reborn. Burial practices differ all over Australia, particularly in parts of southern and central Australia to the north. 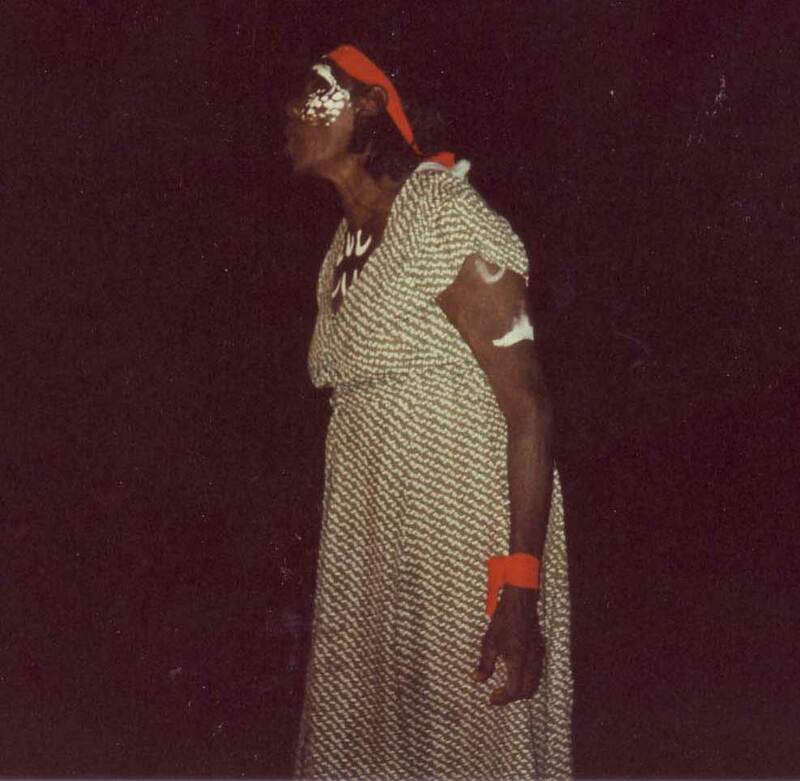 Across much of northern Australia, a person’s burial has two stages, each accompanied by ritual and ceremony. Aboriginal people still maintain their ancient burial ceremonies and rituals. These are of crucial importance and involve the whole community. It is important for the souls of people who have departed from this life to join the “Dreaming”, the timeless continuum of past, present and future. These Sacred Dreaming paths are where mythological ancestral beings travelled and caused the natural features of the country to come into being by their actions. These events are sung in ceremonies that take many days or even weeks. The primary burial is when the corpse is laid out on an elevated wooden platform, covered in leaves and branches, and left several months to rot and let the muscle and flesh separate away from the bones. The secondary burial is when the bones are collected from the platform, painted with red ochre, and then dispersed in different ways. On occasion a relative will carry a portion of the bones with them for a year or more. 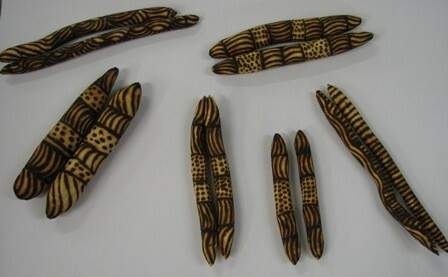 Sometimes they are wrapped in paperbark and deposited in a cave shelter, where they are left to disintegrate with time. In parts of Arnhem Land the bones are placed into a large hollow log and left at a chosen area of bushland. 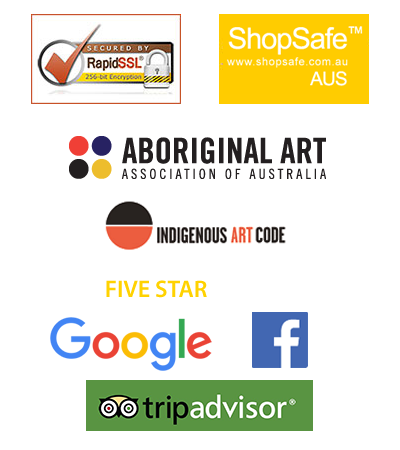 Dating back tens of thousands of years, Aboriginal rock art records ceremonies that have been verified and the same ceremonies and traditions are still continued to this day. Walkabout refers to an unconfirmed but commonly held belief that Australian Aborigines would undergo a rite of passage journey during adolescence by living in the wilderness for six months. 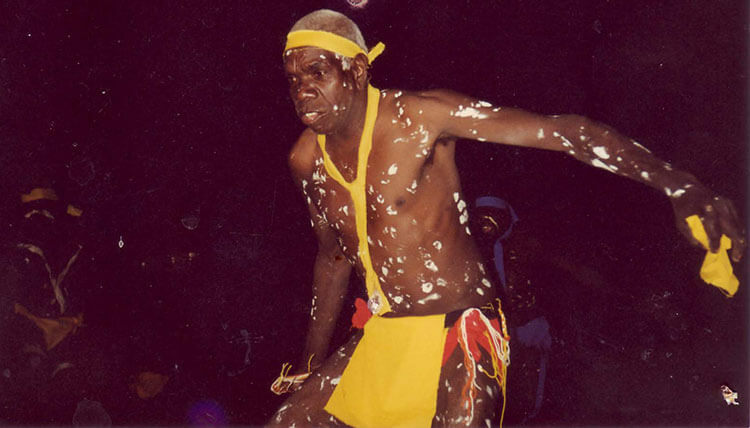 A Corroboree is a ceremonial meeting of Australian Aboriginals, where people interact with the Dreamtime through music, costume, and dance. It is sacred to them and people from outside the community are not permitted to partake or observe the event. They paint their bodies and participants wear various adornments that are special for the occasion. 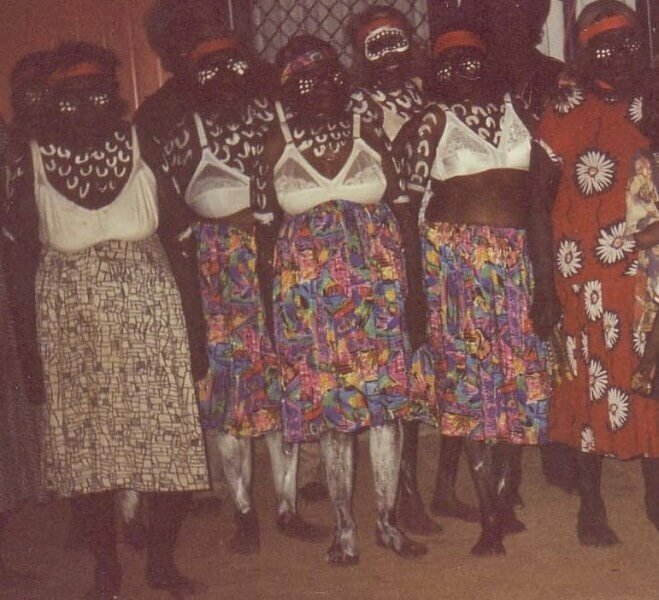 Occasionally Corroboree is practiced in private and public places but only for specific invited guests. A Tjurunga, also spelled “Churinga” is an object of religious significance for Central Australian Indigenous people of the Arrente group. Its native significance are shown in stone objects, wooden sacred objects, sacred Aboriginal ceremonies, bullroarers, ceremonial poles, sacred group paintings, sacred earth mounds, sacred headgear, and sacred chants. Tjurunga means “sacred stone” or “wooden objects”. The tjurunga were visible incarnations of the great ancestor of the totem in question. The body of the ancestor undertakes a metamorphasis into something that will weather all the storms of time and decay. Stone tjurunga were thought to have been made by the ancestors themselves. The wooden tjurunga are carved by the old men are symbolical of the actual tjurunga which “cannot be found”. 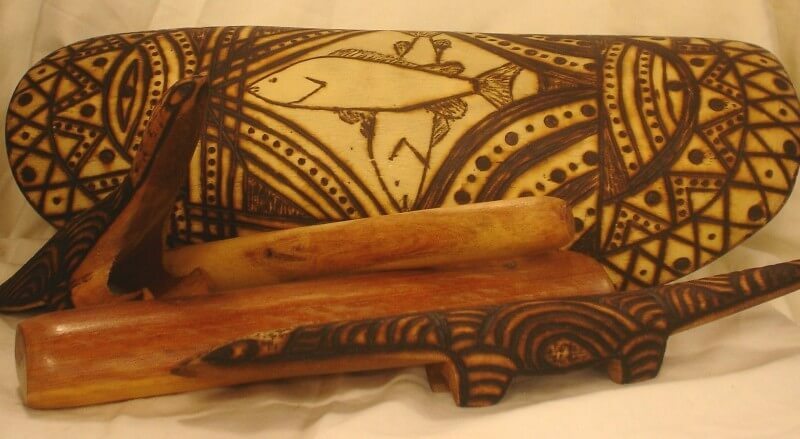 These man-made” tjurunga were accepted without reservation as sacred objects. At the time of receiving his tjurunga a young man may in his twenties. He will often be in his thirties or fourties before the most sacred chants and ceremonies that are linked with it have passed into his possession. As he ages and continues to prove his merit, he receives an ever-increasing share in the tjurunga owned by his own totemic clan. Eventually he may become a member of the assembly of senior Lawmen who are honoured trustees for the ancient traditions of the whole clan. The Aboriginals have practiced Smoking ceremonies for thousands of years. It is when various native plants are collected and used to produce smoke. This has been believed to have cleansing properties and the ability to ward off unwanted and bad spirits, which was believed to bring bad omens. 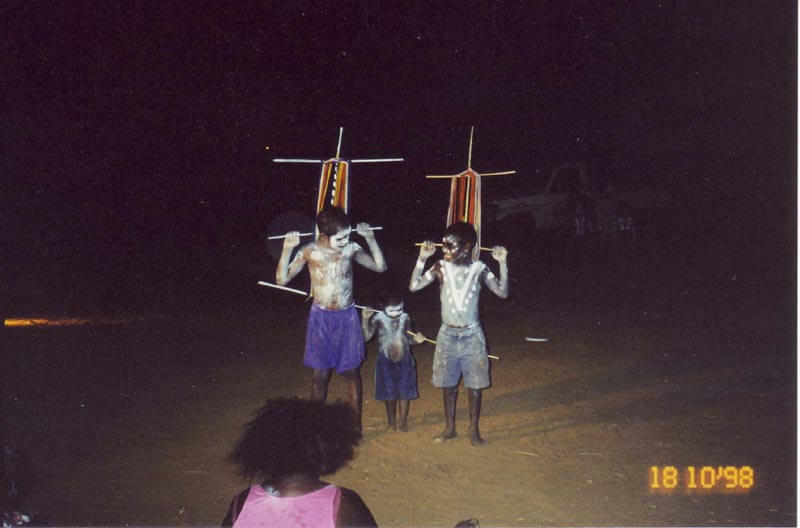 Aboriginal ceremonies have been part of the Aboriginal culture since it began. 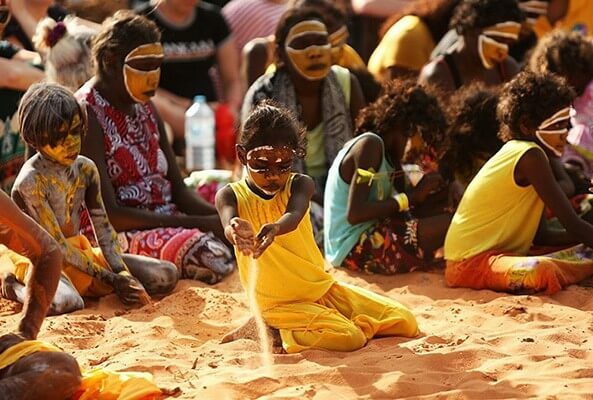 It is part of their history and these rituals and ceremonies still play a vital part in the Aboriginal culture. They are still practiced in some parts of Australia in the belief that it will grant a prosperous supply of plants and animal foods.